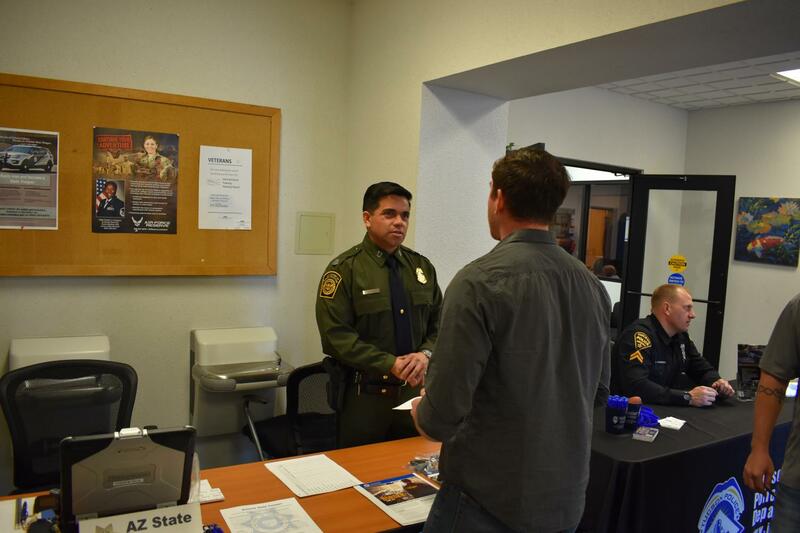 A Border Patrol recruiter speaks with a potential applicant during a job fair at Davis-Monthan Air Force Base in Tucson, March 8, 2018. The U.S. Border Patrol is hiring. And it needs to fill jobs quickly. Recruiters are traveling all around the country, trying to convince people to come and apply. But among the challenges presented, the agency is learning that people just don’t want to work in Arizona. So it’s trying to make this state more appealing. On a recent March morning, a few hundred people crowded a job fair held in a non-descript building on Davis-Monthan Air Force base in Tucson. Hospitals and school districts staffed tables with brochures while in full regalia, front and center of the event, recruiters from the Tucson Police Department, the Department of Public Safety and the U.S. Border Patrol. On its face, it seems like the Border Patrol should be easily hiring the agents it needs. Take Moises Sanchez, a 30-year-old Marine, with short-cropped hair and brawny arms who paused at the agency’s table to look over what it has to offer. "I want to keep serving this country in one way or another by protecting our borders or in whatever other aspects are needed," he said. Sanchez seems like an ideal candidate. In fact, he said he doesn’t even care whether he works for the Border Patrol, those agents in green working in the desert, or CBP, those in blue working at ports of entry into the U.S.
"Locality really don’t matter to me, a job’s a job," Sanchez said. "That’s the way I look at it." But when it comes to staffing the southwest border, Customs and Border Protection is having a tough time convincing people to move here. And so it’s asking cities in the southwest, like Tucson to help sell their town and fill that job. "Something really important for us, when we’re having a dialogue with CBP, what do you hear out there? I mean, 'what do you hear in New Hampshire? What do you hear in Wyoming about southern Arizona?'" said Felipe Garcia, executive vice-president of Visit Tucson, a marketing firm that promotes the city. So what are people saying about life in southern Arizona? "You know something, it’s phenomenal the misconceptions we hear," Garcia said. "So for example, we talk to recruiters, we hear that it’s dangerous because of the proximity to Mexico, we hear issues of 'well, we understand that there’s no supermarkets close by.' That you have to drive hours to get to a grocery store." Visit Tucson shares promotion videos showing sun-tanned bodies on sparkling pools, Sonoran hotdogs, carne asada tacos, horseback riding through Gates Pass, mountain climbing on Mt. Lemmon and Hotel Congress downtown. One problem: recruiters don’t know the area, so Garcia invited the recruiters to let his company show them the area, including the Nogales, Ariz., border region. "It was just like an ah-hah moment, saying 'whoa! this is not what we thought as recruiters in southern Arizona!' And I think it was a really good investment to bring these individuals here to help us bring quality people to our sector," Garcia said. The Government Accountability Office, Congress’s investigative arm, found that the Border Patrol is still shy more than 2,000 agents. That’s on top of an extra 5,000 President Donald Trump ordered to be hired when he took office more than a year ago. The CBP union warns port inspectors are being worked to dangerous levels of exhaustion, often ordered to pull double shifts. Meanwhile, some agents prefer commuting 120 miles to the border one-way from Phoenix. CBP is offering $10,000 cash bonuses to inspectors willing to come to Arizona. And Garcia said that it’s developed a fast-track program so if inspectors take an Arizona position, they can advance to more desirable locations. "Some of the ports of entry in Arizona are in less-populated areas that don’t necessarily have the amenities they want, but there are certain individuals who would love to live in a rural environment," said CBP spokeswoman Meredith Mingledorff. "I’m one of those. I like a nice quiet life, I like a nice quiet scenery. and arizona has that to offer me." Border Patrol spokesman Chris Sullivan is also a recruiter. He said the job is fun. "You can ride ATVs, there’s bike patrol, if you like to ride bicycles, you can do that. There’s horse patrol, there’s different units. flex team units. If you like to hike, you get paid to go out there and hike," he said. The challenge is convincing applicants to take those fun-sounding jobs in a place like Ajo, population 3,000.